'Because I like it better' is a poor argument. That, however, is what most opinions on the net boil down to. 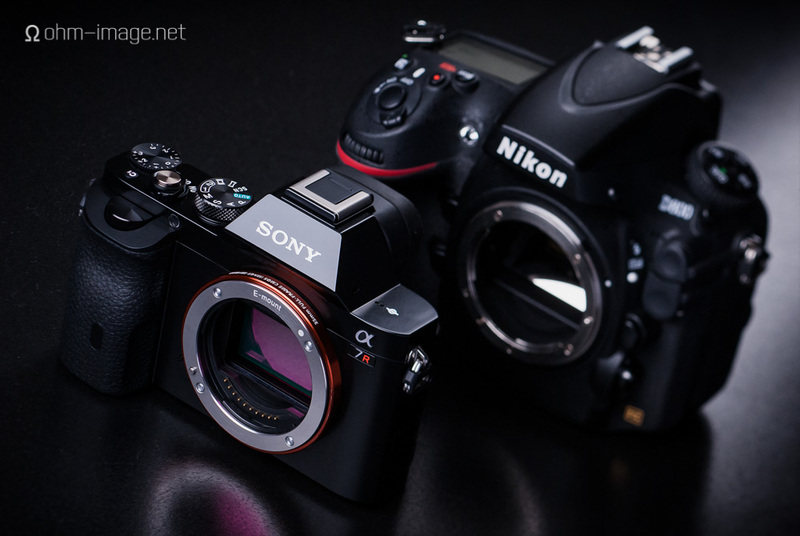 For Ω, the a7r is simply a better still life camera than the D800. With the use of the Novoflex NEX-NIK + ASTAT adapter set, I can mount heavy macro lenses to the a7r's fragile body with the same fearless aplomb I do the D800. Read Ω's full review of the Sony ILCE-7r (a7r) to find what makes this photographer tick, and what doesn't. But the point that sold me on the a7r is Wifi tethering. Wireless tethering allows me to wander around the studio with an iPhone or iPad in my hand and make changes under modelling lights in real-time. No more looking at a concealed computer screen or relying on an assistant to understand my awful English directions. And what the iPhone sees -- indeed, what you see from the a7r's Live View stream -- is worlds better than what you see from the Nikon D800's grainy LCD. Worse, the D800's Live View stream resolves details poorly and is tied to a choppy LCD feed. If a lens is stopped down, or studio conditions are too dark, the LCD can go black, requiring the photographer to bump up the ISO or bump down the exposure settings in order to get a usable preview, before bumping everything back prior to taking the image. If the D800 had a user menu, this would be less of a problem than it currently is. But that doesn't change the fact that the D800's live view system isn't tenable for still life photographers. In rote shoots, three hours can stretch to four, or five hours. A good live view system is of dire importance. Even in a low resolution example such as the below images, the a7r's live view is demonstrably sharper and cleaner. Through the D800's LCD, the word 'OPEN' is blocky and swimming with luminance noise. Ensuring 100% accurate focus is guess work. NOTE: Aberrations in focus and sharpness in this photograph are not the result of Nikon's 50 being worse than the Leica 50. The Nikon is every bit the equal of the Leica Summicron 50/2 when strong backlighting isn't present. Both cameras set to ISO 100 and an exposure of 1/160. Viewed closely, the differences are stark. However, they are nowhere near as stark as when shot at macro distances. The a7r's faster update speed allows minute changes to focus while obviating image stutter. When stopped down, the D800's live view is illegible until either ISO is bumped up, or exposure is dialled down from 1/160 to 1/3. The a7r, on the other hand, manages to keep a somewhat usable live view image. However, the frame rate drops to barely tolerable levels. Both lenses stopped down to f/8. Exposure settings same as earlier. Whether connected to a CamRanger, a computer, or merely viewing the D800's rear LCD, live view output is poor. The a7r's live view, has, in comparison, been a wonder to work with. That isn't to say that I like the a7r. I bought it because it would make work easier and less painful. It isn't a camera I take out when I want to enjoy the act of photography. For that I use a Fujifilm X-Pro 1. If you are interested in why I dislike the a7r as a casual/fun camera, read my review.